There is more to Iran than pistachios, nukes, and ayatollahs. It’s a country of voluptuous racing drivers, abandoned Bizzarrinis, epic traffic jams, smoke-spewing Paykans, and a very laissez-faire approach to traffic control. Deranged world traveler Dániel Belényi has been going to Iran for over a decade and he’s brought us a portrait of its car culture in dictionary form (hint: use the arrows to jump between entries). —Ed. The vehicle which the youth of North Tehran (→) hunt girls with. Since each car is twice as expensive as in Europe, a cooler BMW or Mercedes hints at a serious financial background for those girls who are dreaming about a pink future. According to our trustworthy local sources, a ~ is the most important requirement for sexual adventures, and the most important place as well for those encounters. This is the unit of time which Iranians respond with when you ask the date of a future event’s likely occurrence. ~ is the most popular and most common answer for questions like “When does it start?,” “How many minutes?,” “At what time does it open?,” “When will we get there?,” “How long does it take?,” or “How many minutes to walk?” Relative extent can be any length, the absolute duration fluctuates between five minutes and three hours. The goal is to reassure the anxious guests, but after a couple of ~ answers they start to worry seriously. This expression relates to driving. The Iranian definition is simple: optional distance between two cars which are going in the same direction. It’s never more than 5–10 centimeters (2–4 inches —Ed.) in Tehran. Many people refer to the Thumb Rule: where your finger fits, that place is enough. ~ is a nightmare for western drivers on the roads of Iran: you can see thousands of rear-enders every day. It praises the good sense of Iranians that they thought of wealthy people. A normal Volvo (→) has 40-some seats, but in this model there are only 25 in 3 rows instead of 4. Extremely comfortable, but companies charge 50–100 percent more for the luxury. There are stewards on the bus and they offer you fruit juice and cookies. You can also drink water from the tap. If you are smart enough, you can negotiate the ticket price to approach the normal, 40-seater price. Persians are flexible! The slow bus. In general, most of them were made in the ’60s and they were considered deluxe models at that time. They help us cover the distance between cities. Sane Iranians with a bit of extra money will never use this model. Rural people and the poor use it if they don’t have enough money or have enough time to wait. It stops at every corner, it starts when it’s full—and that always takes 5 minutes (→). In general the price is only half of Volvos (→), and there is no air conditioning, only cross-draft. Tourists like to try it, and then return to the aforementioned Swedish brand (→). The ~ is under protection of God, signs like “Always remember God,” “Allah Akbar,” and pictures of the imams Ali and Hussein remind us of this. You’ll find covered female faces as well, which are also stuck to any place of the vehicle. According to public opinion this phenomenon will disappear from Iranian traffic in a couple of years. The part of Tehran where locals say it is nice to dwell. A bit less chaotic than South Tehran (→), people’s outfits are more westernized, they have better cars, and their properties are much more expensive. According to a few people, traffic is more bearable. A proper resident of ~ never goes to the centre of the city, especially to South Tehran. So if you are going to the south with a taxi (→) driver from the north, you’ll have to help him navigate when you get below 1,200 meters (4,000 ft –Ed.) above sea level. Otherwise, your driver will ask for directions on every corner. The wonder car from Iran. Some people say the design comes from the British Hillman Hunter, but according to the locals it’s a 100% original Iranian model. Several million of these are on the roads. The vehicle is unsustainable both in consumption and emissions. Only the fuel subsidy of the state and the absence of environmental protection make it sustainable. As a result, the average life expectancy at birth has decreased several years in the ~-cluttered urban areas. Otherwise, ~ means “arrow”, but the shape of the car is closer to a brick or a soap dish. The guy who watches the crazy traffic (→) with or without a weapon. His goal is to survive, he never does anything in case of an accident, fire, or in any violation of regulations. He hunts for easy victims like motorcycles without their owners parking on the sidewalk. There has never been any report of a ~ helping to solve any problem. There are no trams in Iran so we are talking about the system of subways (→) and buses. Because of the 15 million people in Tehran (plus the 8 million daily commuters), ~ is an unbearable torture, which, considering the size of the city, has no chance of getting better. Bus lanes operates on the main roads. Apart from the parks, the metro is the only clean place in the city, so after all it’s a good choice. ~ is extremely cheap, but to go between any two places it’s better to allocate at least an hour of traveling if both locations are near the metro. The place for transportation. It differs from its European counterpart by the markings on the road: the only reason they exist is to employ the workers and the sign painters. The main rule of the ~ is very simple, in several places they call it the dog eat dog model. Trucks are the kings of kings, buses are something big, a normal car is just moving along, motorbikes are survivors, and pedestrians are nothing more than molluscs. In Tehran, you’ll also find cyclists! They are an endangered species. Literally means the rules of the road but the Iranian ROTR book is about as long as the annual report of Aston Martin trade between Guinea and Somalia. In the case of a collision if we made a mistake, we apologize and kiss the other driver, if the other was wrong, we try to hit him, and let the mob around us calm us down. At red lights you can always turn right! Only the strong survive. You can prevail only by will, violence and courage. If you’re not quick and decisive, you’d better not leave the airport. Urban vehicle in place of buses. Its main features are the predetermined route and the fixed tariff. Urban dwellers change two to three times on the way from A to B. They start when the car is full and the main advantage is that you don’t have to negotiate the price. 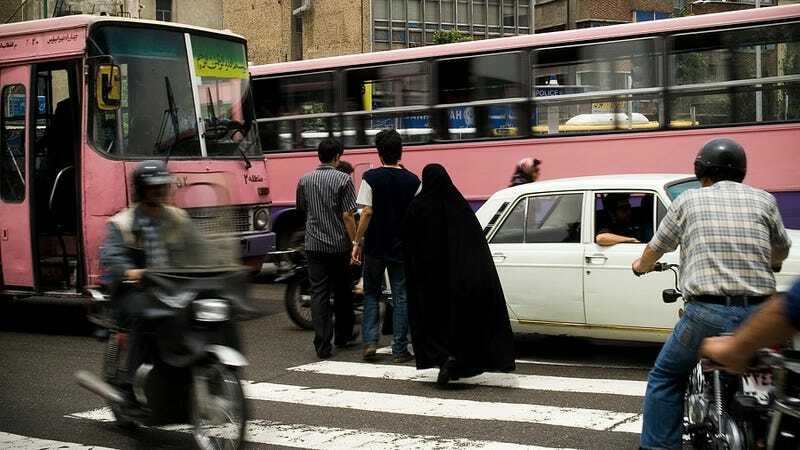 (In cities, especially in Tehran): the roadway (→) where pedestrians can legally disturb motorcyclists. In Tehran, there is a wide and deep tunnel between the ~ and the roadway, but cars somehow still use it at times. Motorcyclists use it to avoid the traffic jams (→), and every vehicle parks on the ~ when the roadside is full. It’s really dangerous to walk on the ~ in Tehran, bikers may hit you from the back. While Hungarians were fooling around with contracts, the Iranians built three subway lines with the Chinese. It takes more than an hour to go all the way on them. The only drawback of the ~ is that the Iranians are unable to observe the rules of using it. In spite of every subway car showing the correct order and method of disembarking and boarding, the two crowds go against each other every time the doors open, and then the mayhem begins. The car which anyone can travel in. In Iran the trade permit is not taken too seriously, so any vehicle can become a taxi if the owner just hops to the corner to buy cigarettes but he meets somebody there who needs a ride to the airport. The price should be agreed in advance. The best strategy is to say a concrete amount in Farsi, which is more or less our last price. In Tehran this amount is about $20. Don’t have high expectations about the car’s condition or the driver’s qualities. You can smoke in a ~, in fact, the driver will often offer you cigarettes himself. The situation in which a proper urban Iranian spends a quarter of his life. Dedicated to lighting the streets and to serve for a more enjoyable urban scenery, they are recommended rather than mandatory. The bus. It helps transport between cities, it is fast, and almost always has western standards of quality. Sometimes less (→), sometimes more (→). Between big cities they usually go every hour, and if you’re going from Tehran to Qazvin, you can take almost any bus which is going West. A parking place (→), a taxi (→) terminal, or a market. Dániel Belényi is a journalist and photographer who travels all over the world. He’s made illegal border crossings in West Africa, chatted with gun-toting Libyan rebels in Benghazi, traveled the length of the Karakoram Highway, and climbed the 18,406 ft volcano Mount Damāvand. He writes about his travels in Hungarian and English at Daniel from Hungary and posts photos from Iran at Every Day Iran. This story originally appeared on Daniel from Hungary on January 10, 2011, and was republished with the author’s permission. Photos by François Bouchet (top) and Dániel Belényi.